The waxing crescent moon shows sunrise over many craters. The next few nights are the best time this month to observe the moon with binoculars or a small telescope. Tonight (Feb. 9) the moon is a fat crescent. It is six days old, a day short of first quarter. The sun's light will be falling on the moon from the right, causing very oblique lighting all across the center of the moon's disk, the boundary between sunlight and shadow known as the terminator. Because of the moon's rapid movement around the Earth, the direction of the sun’s light changes greatly from one night to the next, making the study of the moon a constantly changing show. 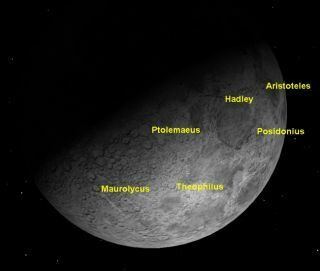 The first thing to notice about tonight's moon (Feb. 9) is its orientation. For observers in the northern hemisphere, the terminator is almost horizontal, rather than the vertical orientation shown in most books. Despite recent videos on YouTube, there is nothing unusual about this. It is caused by the angle which the moon’s orbit makes with the horizon at this time of year, so that the moon appears to be lit from below. Think for a moment about where the sun is located, and you’ll realize that the moon’s orientation makes complete sense. This map of the moon's craters shows some of the best natural landmarks to look for when observing the lunar surface. In a small telescope, or even in binoculars, many lunar craters are visible. Besides being landmarks on the moon, these craters are named for famous astronomers of the past, so gives us an entrée into the fascinating history of astronomy. Two of the most prominent craters at this phase of the moon are Theophilus and Posidonius. Theophilus was the bishop of Alexandria in the fourth century, and the spectacular crater named after him is 62 miles (100 kilometers) in diameter and 14,400 feet (4,400 meters) deep. Posidonius was a Greek astronomer who lived around 100 BC. His crater is slightly smaller than that of Theophilus. It's about 59 miles (95 km) in diameter and only 7500 feet (2300 meters) deep. The floors of these two craters represent two extremes: Theophilus deep and terraced, Posidonius flat and marked by smaller craters and a complex system of rilles (shallow grooves). By Thursday night, the moon has moved around the Earth to its first quarter position: lit exactly from the side, its terminator is straight and almost horizontal. The sun now rises over the craters Maurolycus and Aristoteles. Maurolycus is named for Francesco Maurolico, a sixteenth century Italian mathematician and opponent of the Copernican theory that the Earth revolved around the sun. This was still a politically "hot" issue at the time the moon’s craters were named, and so Maurolycus was given a larger crater than Copernicus. Maurolycus' crater is 71 miles (114 km) in diameter opposed to the 58-mile (93-km) wide Copernicus crater. Galileo, the most famous astronomer of the day, only rated an insignificant 10-mile (15.5-km) crater! Aristoteles, on the other hand, was well known both in his own time, the 4th century BC, but still today as one of the greatest philosophers of all time. His crater is a beautiful one with terraced walls, 54 miles (87 km) in diameter. On Friday night (Feb. 11), the terminator has moved to reveal the mighty Ptolemaeus. This gigantic crater, 95 miles (153 km) in diameter, is named for the greatest Greek astronomer of ancient times, Claudius Ptolemy, who lived in the 2nd century. Look a bit to the north of Ptolemaeus for the Hadley region. There is no crater named Hadley. Instead the name is applied to a prominent mountain and the sinuous rille at its base. This area is most famous as the landing site of Apollo 15 in 1971. If you have a good telescope, study the Hadley rille (rille's are the lips of moon craters) and then compare this with the photographs taken on the surface of the moon by the Apollo astronauts. Who was John Hadley? A 17th century instrument maker, a pioneer in reflecting telescopes and quadrants. One of the greatest treats for an amateur astronomer is watching the moon’s terminator sweep majestically across the face of the moon — and this is the perfect week to do that. This article was provided to SPACE.com by Starry Night Education, the leader in space science curriculum solutions.